One of the best things about the internet is being able to find a wide range of products to help treat Eczema and Psoriasis, both of which I've had since I was a child. If you've been following my blog for a while now, you'll have no doubt seen me mention my struggles with eczema flare-ups, especially at this time of the year and when the seasons change. Both Eczema and Psoriasis can be incredibly debilitating depending on the severity of the individual's symptoms, and I had one of the worst Pompholyx flare-ups (also known as Dyshidrotic Eczema) over Christmas which I'm still trying to get under control now. For these reasons, I'm always open to trying out products which are specially formulated to help these conditions as I have found that it can sometimes take a lot of trial and error before you find something that really works for you. 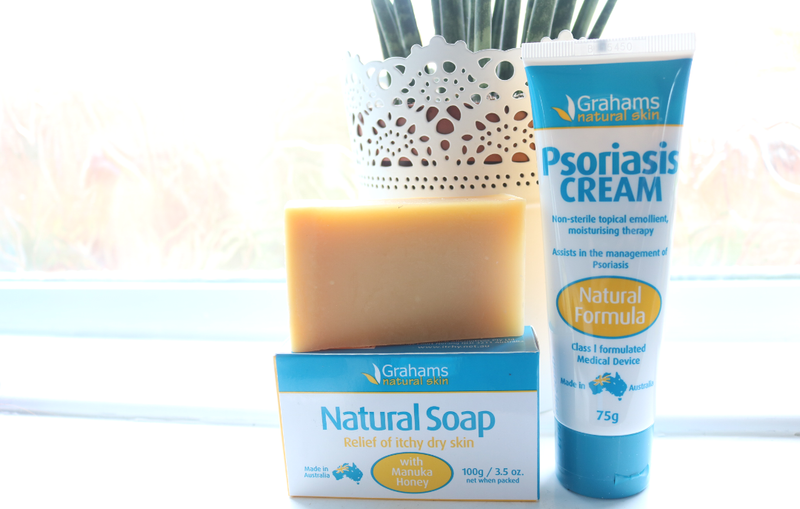 Lately, I've been trying out these two products from the Australian brand Grahams, and like so many companies that specialise in this area, Grahams was set up by a husband and wife team to help their son who was suffering from eczema and needed a more natural alternative to what was available on the market. After 17 years of perfecting their formulas, they now have a range of products which are dedicated to those who need something more natural based and steroid-free, to soothe their Eczema, Psoriasis and Dry Skin problems. If you have any kind of dry skin condition, you may find switching your regular hand wash and/or your shower gel to a more gentle soap can really help to alleviate some of the symptoms. I personally find that my eczema is often triggered by SLS that's the commonly used foaming ingredient in many mainstream products, so I try to avoid it as much as possible. 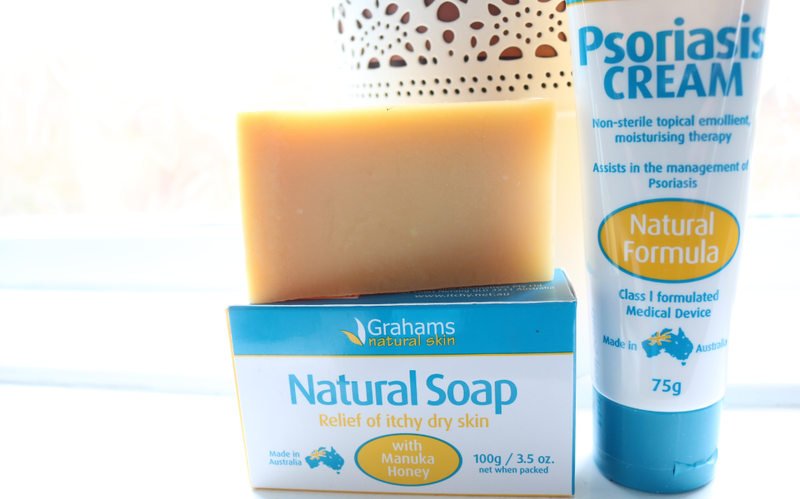 Grahams Natural Manuka Honey Soap is free from SLS and sulphates, and instead is made from just seven natural ingredients; Palm Oil, Coconut Oil, Olive Oil, Purified Water, Glycerin, Manuka Honey and Neem Leaf Powder. It produces a light lather and feels very moisturising, but doesn't have any noticeable scent to it so I like using it mainly as a hand soap, although it does work well in the shower if you want something that feels very neutral and 'clean'. The only negative is that I would prefer to use a soap that's made without palm oil, so I'm not sure that I would repurchase it. I've had a stubborn patch of Psoriasis on both of my hands since the start of the year so this Psoriasis Cream arrived at the perfect time for me to test it out! Described as a 'Class 1 Formulated Medical Device' in Australia, this product is an effective, non-sterile topical emollient with clinical data to back up its formula. Key ingredients include Purified Water, Manuka Honey, Calendula, Urea, Avocado Oil, Gotu Kola Extract, Jojoba Oil and Shea Butter to bring instant relief to the symptoms of Psoriasis. It's a relatively thick cream product as you'd expect from a product of this nature, but it doesn't feel overly sticky or greasy and depending on how much you apply, you may be surprised by how quickly this absorbs compared to similar emollients that I've tried in the past. The fragrance-free formula will also be appreciated by those who have sensitive skin, and the cream can be used anywhere on the body and face. It's not been a miracle worker for my psoriasis, but it has definitely helped to improve the worst of it by keeping the skin nicely moisturised, so if you're looking to try something different, it's certainly worth a go. What do you use for managing eczema and psoriasis?